Monadnock 2448H 2448H Peacekeeper Shield with Ambidextrous Handle FREE SHIPPING! 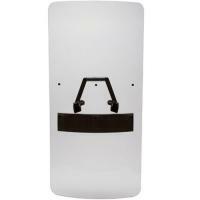 The sturdy 2488H Peacekeeper Shield from Monadnock is a lightweight and versatile riot control tool. It is made from durable polycarbonate materials, making it shatter-resistant and giving it the strength necessary to deflect thrown projectiles and debris. Because it is transparent, it will not restrict your visibility and threat awareness while in use. It meets ASTM D3763 and ASTM D1929 standards and weighs in at less than seven pounds, light enough to be comfortable for longer operations. The injection-molded triangular handle provides a secure grip and can be used equally effectively with either hand, or gripped with both hands for more higher-impact applications. ©2002-2019 CopsPlus.com: Monadnock 2448H 2448H Peacekeeper Shield with Ambidextrous Handle FREE SHIPPING!